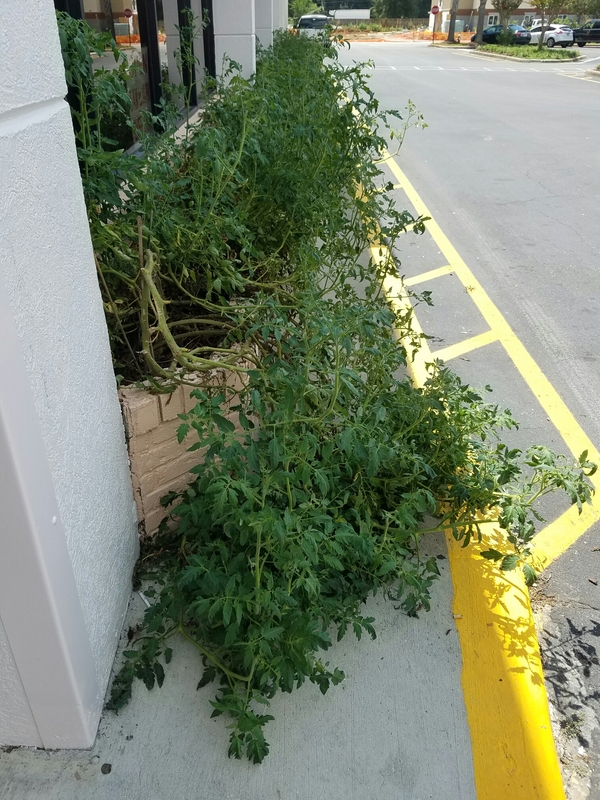 I was popping into a grocery store when an unusual planting caught my eye. Usually stores plant flowers, bushes, or trees to beautify their landscape, but this was different. Do you recognize these plants? It’s a very interesting choice for a grocery store. If you guessed tomato, you’re correct. I didn’t see any ripe fruit, or even any decent sized green tomatoes, but that didn’t surprise me. It’s still pretty hot here, and not many varieties of tomatoes will set fruit at these temps. I do have to say that I was impressed by how good these plants look. Mine have usually succumbed to mildew, blight, or some other ailment by now. 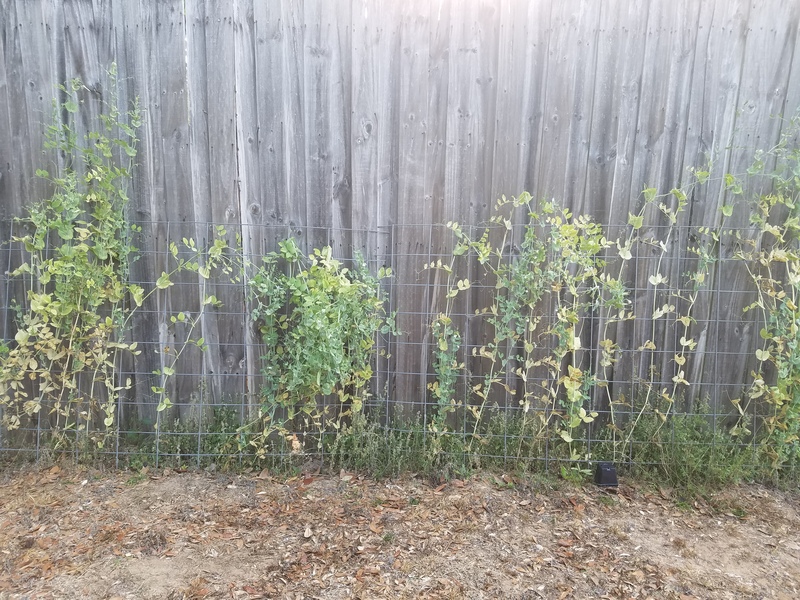 In about a month or so, they should be overrun by tomatoes. Anybody else in Florida have tomato plants that look this good? My front flower planting has filled in nicely, so I’ll share some of those hardy souls with you soon. It’s almost time for fall plantings, and I am looking forward to that! I’m planning to start over in the fall, but for now I’m going to emphasize the positive. Like these peppy little flowers. 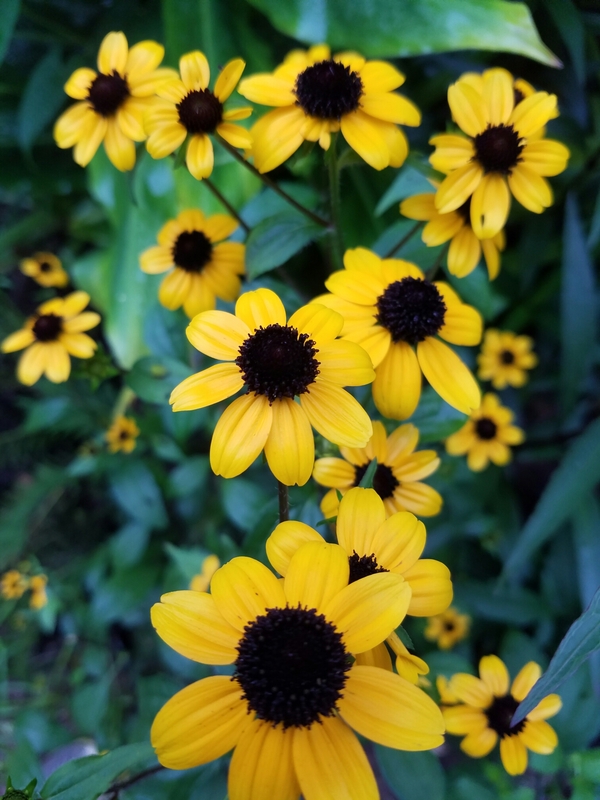 These little black eyed Susans are great. I was expecting them to be much bigger, but they are so sweet. 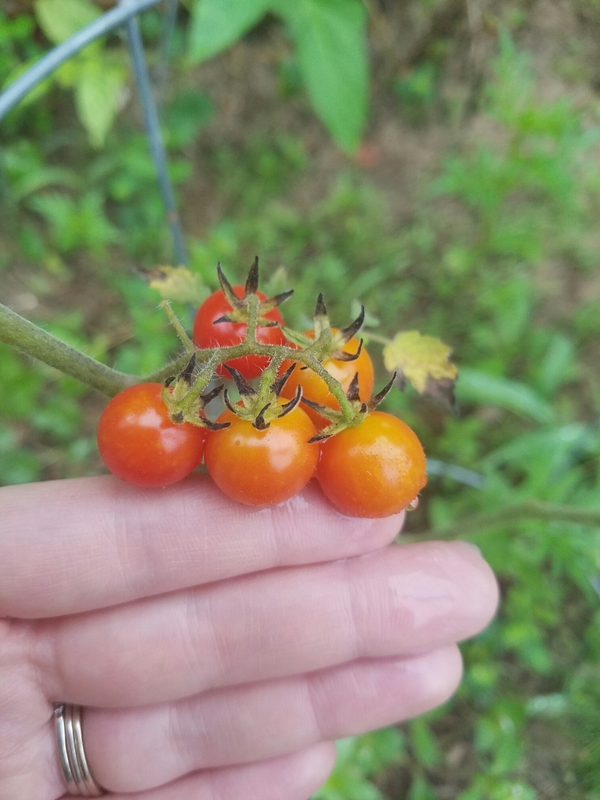 Aren’t these the cutest little tomatoes you’ve seen? I’m going to save seeds and plant more. If I start seeds this month, they should be ready for the fall garden. 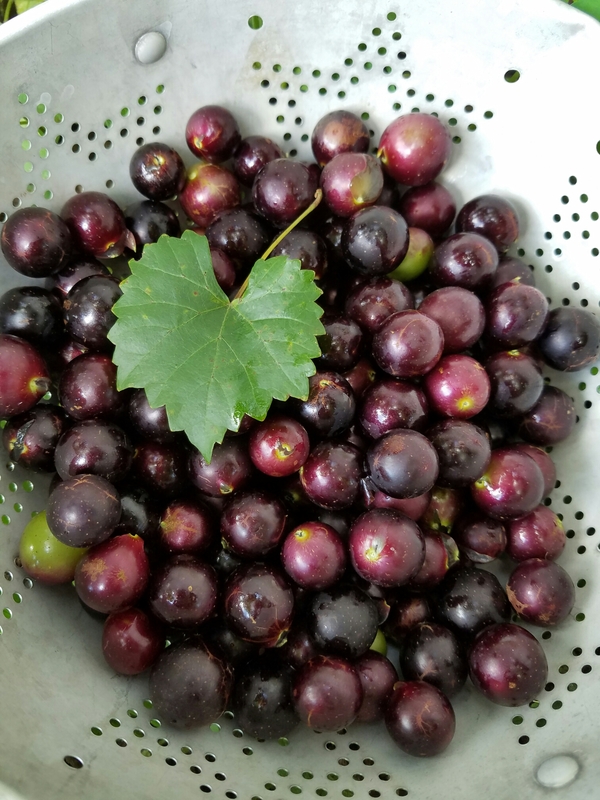 I’m still picking muscadine grapes from my backyard. They’re growing wild up some trees, and I have been enjoying them fresh. Picked this beauty this morning. 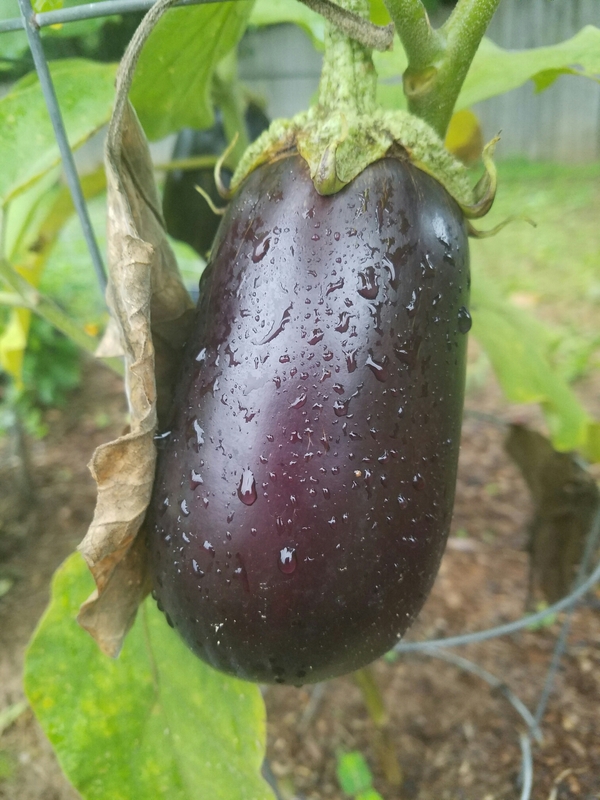 I saw a yummy recipe with eggplant, tomatoes, and cheeses that I may try. I usually dice eggplant, sauté it with garlic, then add it to a veggie scramble; but I may branch out this time. 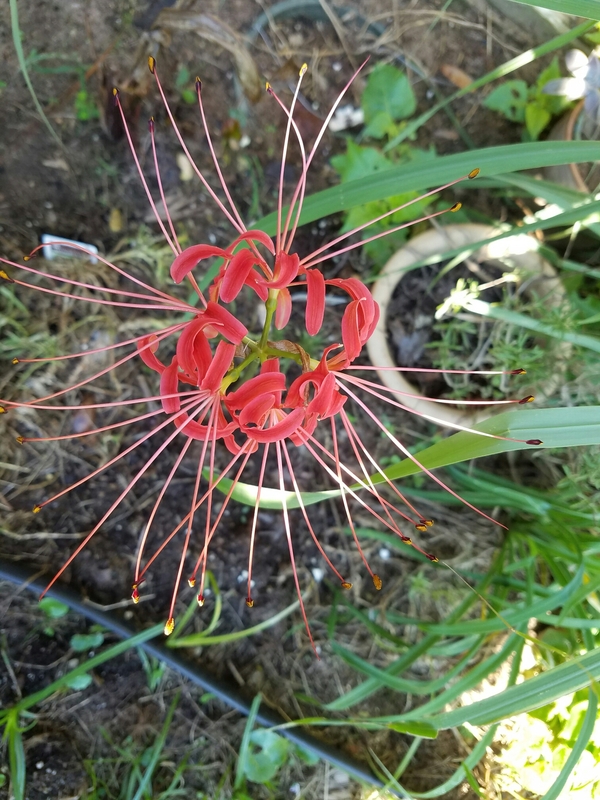 What’s going on in your garden? Any plans for a fall garden? If you have grape vines near you, it’s time to check them! I just had some of the sweetest grapes that I have ever tasted. Maybe I’ll make some jam with the next batch, but I think these will be consumed quickly! I had to zoom in to get a shot of all these grapes far above my head. Any suggestions for how to get them? Besides borrowing a ladder? 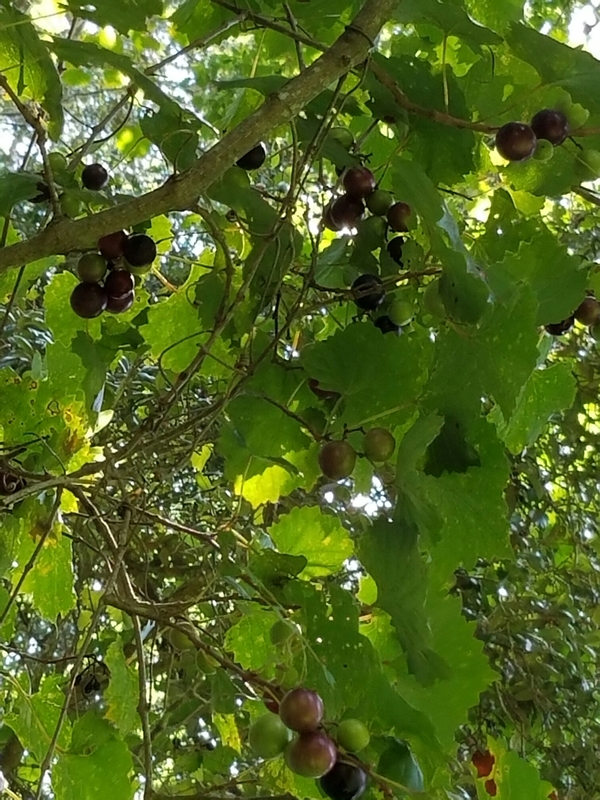 The taste of a sun-warmed perfectly ripe muscadine grapes is marvelous! Let me know if you find some! If you do much produce shopping at all, you know that $1/lb. for fresh blueberries is a great price. 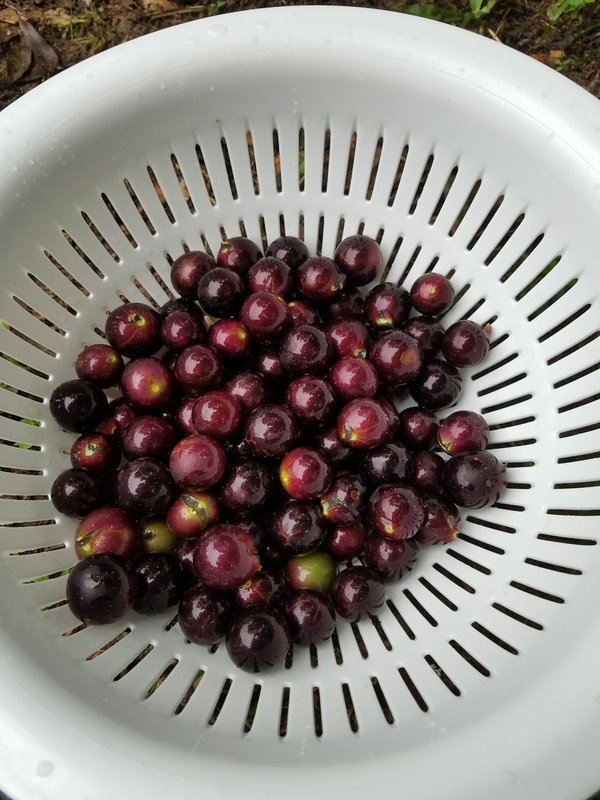 I had a wonderful experience at Touchablue Berry Farm, and I have 3 tips for you if you decide to go too! Usually the areas nearest the entrance are picked over really well. We showed up in the evening, saw the other vehicles, and planned to go into the rows a bit, but got caught almost immediately by the flush of berries. So many berries!!! The farm provides the containers lined with bags for picking. There are various sizes of buckets outfitted with ropes to hang around your neck, leaving both hands free for picking. 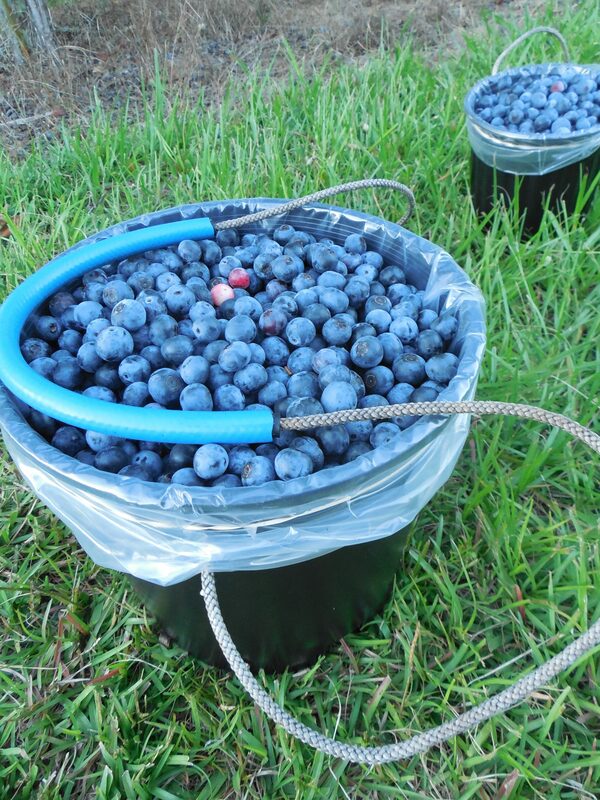 The large black buckets hold about 8 lbs of berries, which get a bit heavy toward the end. The smaller black buckets hold about 3 lbs. We ended up with 20 pounds of blueberries!! I made some blueberry jam the next morning. Can’t get much fresher than that-blueberries canned less than 24 hours after picking! Here’s me after about 1.5 hours of picking. Note the hat. I’ve pretty much gotten my face back after my fluorouracil cream saga, but my hat is a common addition to my outfits and sunscreen is a common part of my getting ready routine. Plan for an evening picking session. We arrived around 6:30 pm, and that meant that shadows were lengthening and it was getting cooler, but we still had plenty of time to get lots of berries. If you want to fill a large bucket, I recommend you to fill a smaller bucket and transfer it to a larger. A 8 lb bucket around your neck gets a bit heavy after a while. It’s a great setup and a wonderful place for a family evening. 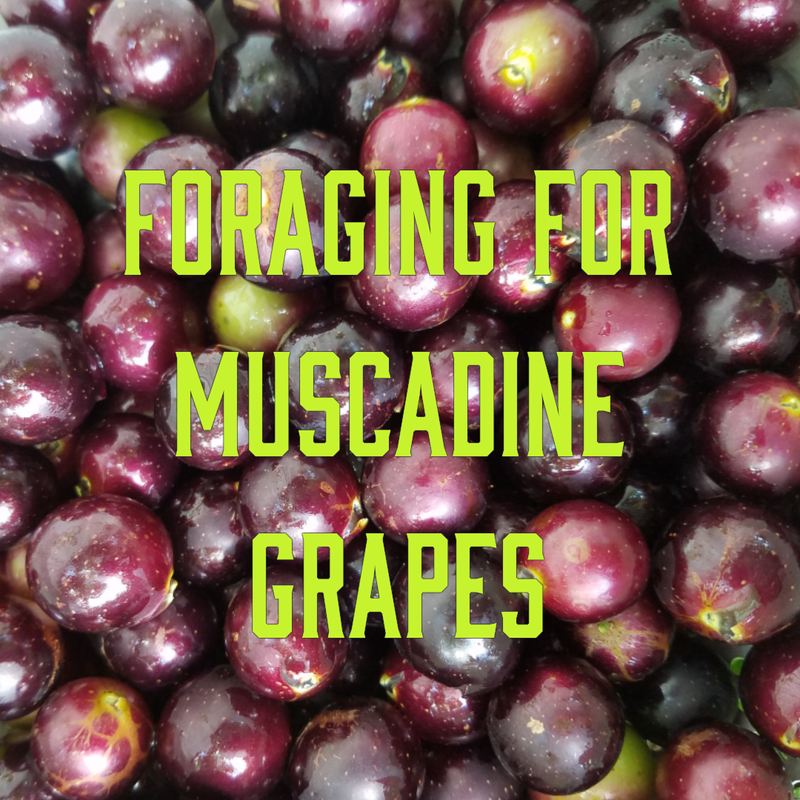 They also have long rows of muscadine grapes, which will also be $1/ lb when they’re in season. Maybe I’ll try making some grape jelly this year. Hard to beat that price! You can like them on Facebook to see what others are saying and hopefully they will update when grapes are ready. June can be tough for being outside, but there are still things to do and even crops to plant. Look for a post on what you can do in the June garden soon! Let’s look at something besides my face, shall we? It still hurts pretty bad from the Fluorouricil cream and its effects, but I can’t complain. I have a friend currently having treatment for melanoma. There’s a difference between a face that hurts when it smiles and a smile that is hurting. I have had a great year with my zucchini already. Usually I get about 4 squash, then the squash vine borers arrive to kill the plants. I planted black zucchini (I still think they look green) and they have done so well. The cherry tomatoes are starting to ripen, and I have been pleased with the ‘Tendergreen’ beans. They’re one of my new favorites. In North Florida, the blackberries are ripe! 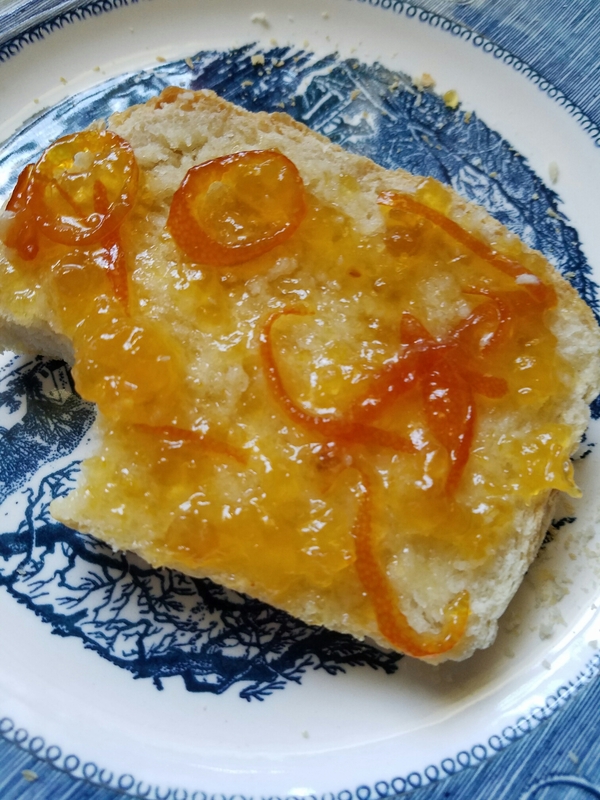 I been foraging twice and have made some jam. You should go look for some too. I saw a 12 oz package of blackberries for $5.99 yesterday!! Granted, the ones I found are much smaller, but you can’t beat the price! 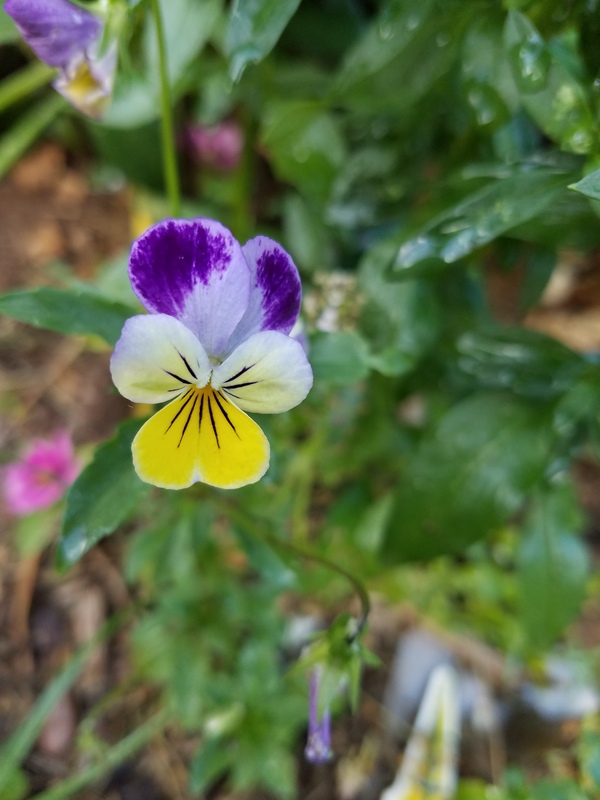 I’ve had to do my picking and gardening in the shade because of the treatment for my pre-skin cancer spots, but I feel so much better some time in the garden. I think today might be a good day to make some chocolate zucchini bread. 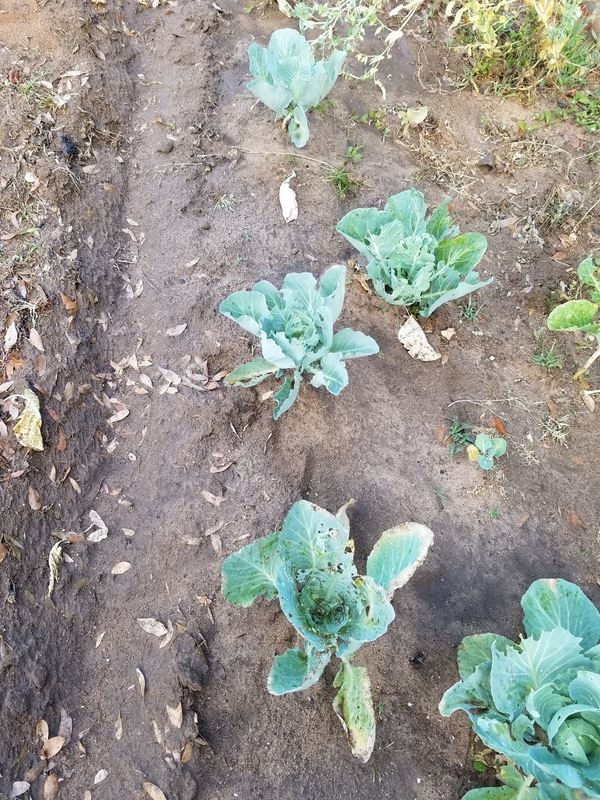 I have some more gardening tips and ideas for you, especially if your daikon radishes are still bolting. If the seedpods have already dried, you can save the seeds like a ninja! 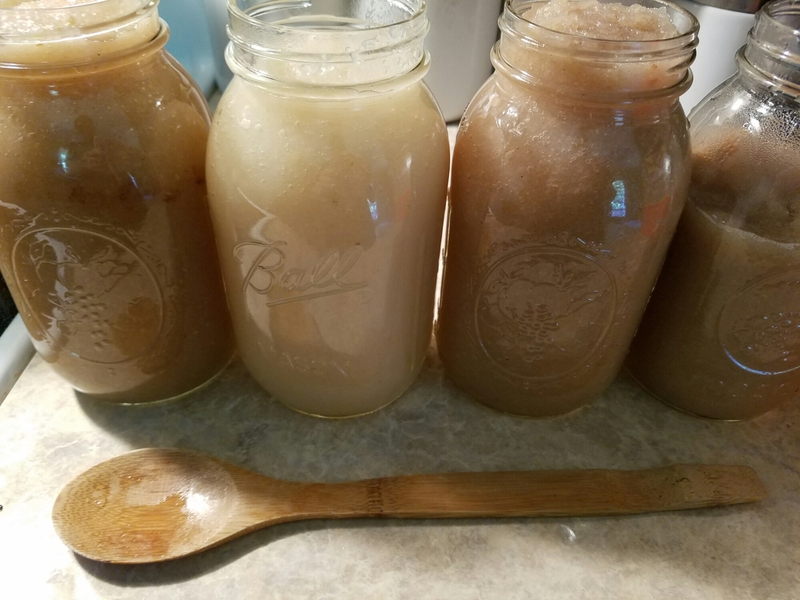 I have harvested my potatoes, so also look for a post on how to harvest a small crop of potatoes. Congratulations to all the graduates out there- I made a homemade chocolate cake with mocha frosting and coral peonies- pictures of that coming soon too. I hope you get to go outside and do some gardening, but please wear a hat and sunscreen! I was excited to see all the pretty white flowers in my front yard landscaping this spring. I have given up on eradicating the brambles, and have been rewarded with berries. Last year I had roses and berries growing together and I embraced the beautiful chaos.What else can you do when a new baby demands attention? That particular variety seems to be done(dewberries, maybe?) and others are ready elsewhere. Keeping an eye out for other patches of flowers led me to some yummy blackberries this evening. We took home about 6 pints, and probably about another pint was enjoyed super-fresh. Right now my plan is to make some blackberry jam, enjoy some fresh, and maybe make a cobbler. Any other bright ideas? 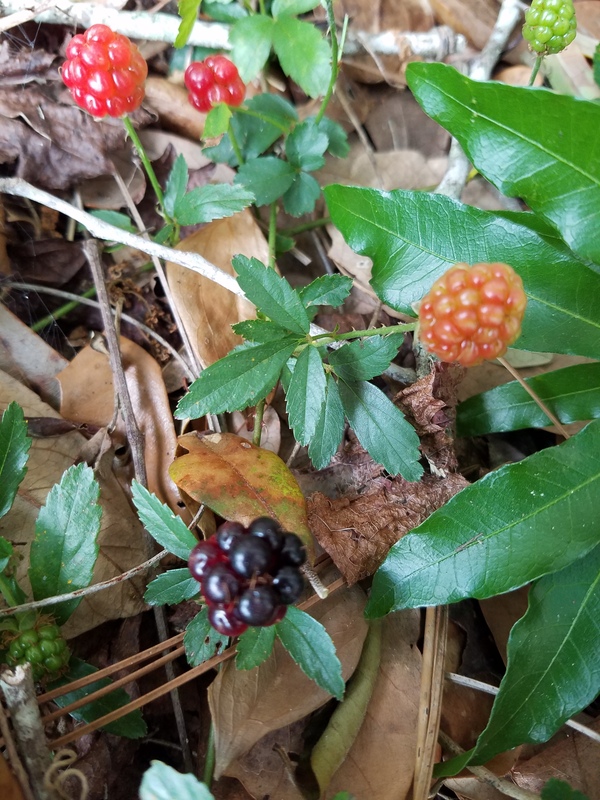 If you are in North Florida, now is the time to look for these delicious berries! Concerned about food miles? I still get excited about serving my family veggies that were harvested from our backyard. Zero food miles and incredible freshness. I love farmer’s markets, but it’s also fun to shop in my backyard. Have you been considering starting a garden? Love the idea of growing vegetables in your backyard but think you have a black thumb? Maybe your previous attempts failed. Find out what other gardeners are planting in your area. Find out where they’re planting them-sun or shade? Copy them shamelessly; they won’t mind. 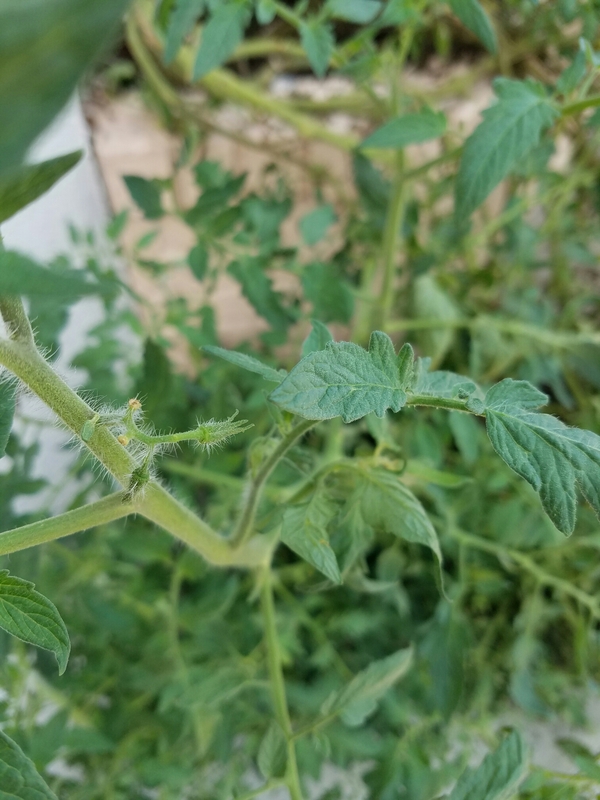 Once you pop that first sprig of fresh mint into your tea, eat that first real tomato, find out what cucumbers are supposed to taste like; you’ll be ruined. Eat local. It’s so wonderful. It’s a great time to get those summer gardens started! Here’s what I’m planning to do this month. Get basil in the ground. 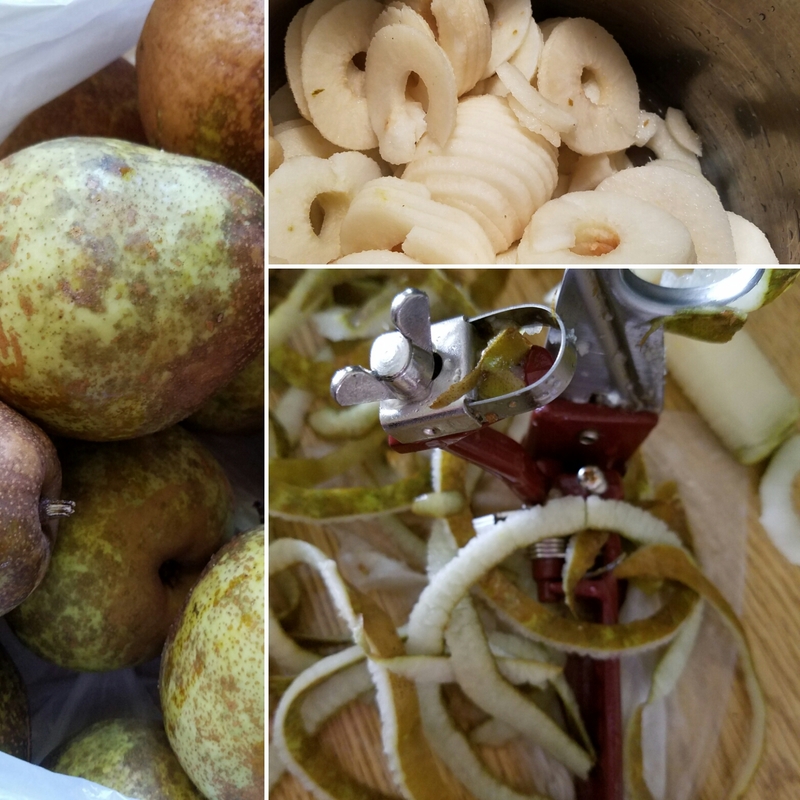 It’s not too late to start some, and it makes wonderful homemade pesto! Set up and plant a pole bean teepee. Hopefully I will get lots of cucumbers to make refrigerator pickles! What’s on your agenda for this month?